It’s been ten months since David Beattie and Mark Pollack have seen each other. The circumstances are much happier this time. “Just overwhelmed with joy and everything they could do. You know, you don’t really get to meet people that saved your life,” Beattie said. Lieutenant Pollack and his crew of North Royalton firefighters, Lt. Joe Bartinelli, Robert Hughes, Christian Sary and Tom Sargent, saved David’s life last September. David’s mother, Libby, said she is forever grateful to the firefighters. “He wouldn’t be here if it wasn’t for these guys. You get once chance at it, one chance, and they saved my son,” Libby said. 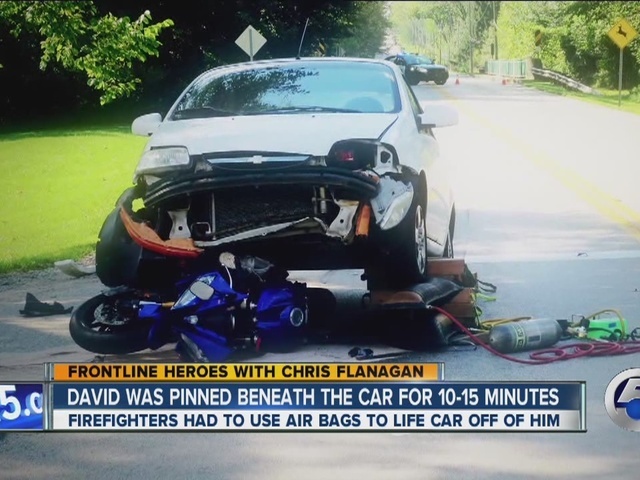 A woman who was texting and driving rear-ended David’s motorcycle on West 130th street at Valley Parkway as he was on his way to school at Cuyahoga Community College. David was dragged 104 feet beneath her car. “I remember being pushed across the ground thinking 'This is it, I’m done. I’m not going to survive this,'” David said as tears streamed down his face. David was pinned. The firefighters were forced to use airbags to lift the car off of him. “I’ve been with North Royalton 12 years and this was probably the second time I’ve used it. It’s not something you use very often, but when you do it’s like, thank God we have that,” firefighter Christian Sary said. The accident was the beginning of a long and painful road for David. His scars are both physical and emotional. “I had 7 surgeries in 21 days in the 30 days in Metro’s burn unit,” David said. Meeting David and his mother, Libby, struck a nerve with the firefighters. They said it’s rare for an accident victim to thank them in person. David Beattie can’t thank these firefighters enough for giving him a second chance at life. If you’d like to ‘Help David Recover’ by aiding with his immense medical bills, you can donate to this fundraising campaign .